Nordic Semiconductor today announces the introduction of the nRF52811 System-on-Chip (SoC), a fully-featured connectivity solution that supports Bluetooth® 5.1 Direction Finding and a range of popular low power wireless protocols for applications such as gateways for smart home and industry products. The SoC expands Nordic’s highly popular nRF52 Series platform by adding a device that combines the low cost of Nordic’s baseline nRF52810 SoC with the multiprotocol support of Nordic’s mid-range nRF52832 and advanced nRF52840 SoCs. The nRF52811 is also the first product in the Nordic low power wireless range to support Bluetooth 5.1, which adds Direction Finding to the high throughput, long range, and enhanced coexistence capabilities of Bluetooth 5. The nRF52811 SoC’s Bluetooth 5.1 Direction Finding enables positioning solutions to not only rely just on received signal strength indicator (RSSI), but also the actual direction of a signal. This improves accuracy significantly and opens up new applications. There are two types of methods for determining direction, angle of arrival (AoA), where the direction of the received signal is calculated, and angle of departure (AoD), where the direction of the transmitted signal is calculated. Direction finding can operate in either two or three dimensions depending on the selected design complexity and antenna array. 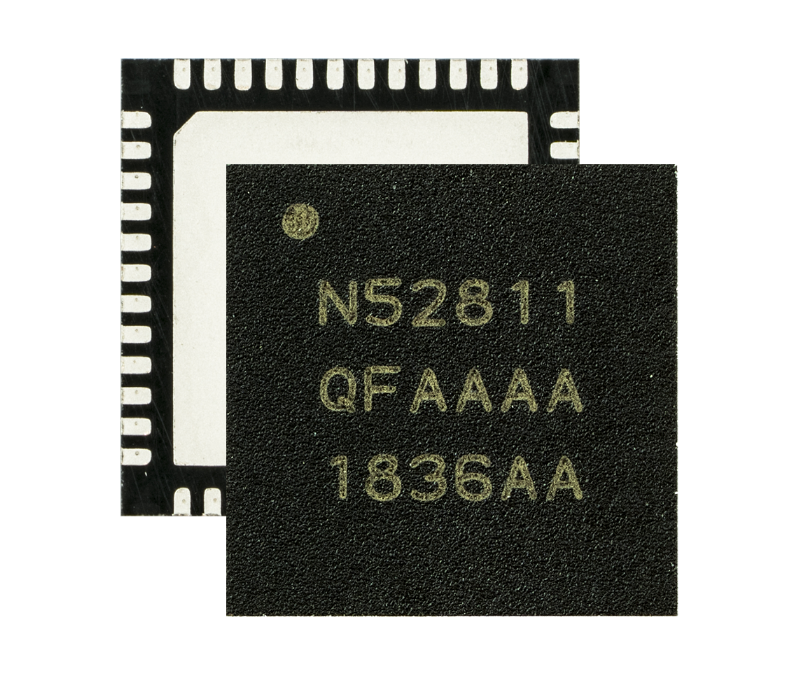 The nRF52811 SoC is the ideal choice as a transceiver for both the AoA or AoD scenarios. Bluetooth 5.1 hardware functionality is built-in to the nRF52811 SoC. The nRF52811 SoC will be produced in a 6x6mm QFN48 package with 32 GPIOs, a 5x5mm QFN32 with 17 GPIOs, and a 2.5x2.5mm wafer level CSP32 with 15 GPIOs. All packages are compatible with those of the nRF52810 SoC enabling reuse of the same PCB layout. All versions of the nRF52811 SoC are available now. Full capabilities of the nRF52811 SoC—including Bluetooth 5 Long Range, Bluetooth 5.1 Direction Finding, and Zigbee 3.0—will be made available through software releases during 2019. Together with our Nordic Module partner Raytac we already have module samples incorporating the NRF52811. Please contact us for more information.